Our tour takes your Primary or Secondary students to iconic places that tell the evolving STORY of Federation, the creation of the Australian Nation as expressed through Melbourne’s history, buildings, culture, identity and people. Our city’s structures reflect our aspirations as Australians and the impact of on nationhood of significant events, characters and cultural groups. Milestones included the impact of settlement, gold rush, war and depression, economic cycles of boom and bust, social movements, immigration and changing technologies. Send us your learning outcomes and we will adapt this tour specifically for your classes. The book Nation Builders authored by Meyer Eidelson, Director Melbourne Walks, includes biographies of 45 key Melbournians representing Australian nationhood. Learning Outcomes:: Students respond enthusiastically to this challenging and stimulating journey through the streets, lanes and arcades of the Melbourne CBD. This interactive two hour program allows them to explore the events of Federation through Melbourne’s history, identity and culture by visiting places which tell stories about milestones from Indigenous origins to early settlement to gold rush expansion to Marvellous Melbourne to a modern centre of art, architecture, and culture. 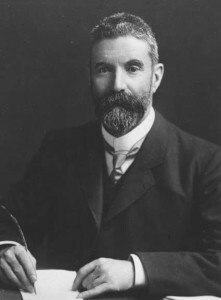 Alfred Deakin, Federation campaigner, Melbourne journalist, animal rights activist, reformer, spiritualist, poet and thrice Prime Minister. We start outside the Deakin Building in Federation Square. His wife Patti Deakin was a reformer and founder of childcare services. Identities: Each student is allocated an historic identity of an influential Melbournian. We provide interactive activities e.g accessing buildings, handling artefacts, two-up and many images. They meet challenges in a fun way that promotes learning and questioning. We can design a specific mix of destinations and activities to meet your specific learning needs including from our many other school programs. Just wanted to say a big thank you for the excursion for Our students loved the excursion and are still raving about it. Thank you for your enthusiasm and knowledge that you imparted to the students. St Mary of the Cross MacKillop (Epping). WE VISIT A VARIETY OF CITY CENTRE LOCATIONS DEPENDING ON TIME AND YOUR LEARNING OUTCOMES. WE HAVE A CHOICE OF TWO ROUTES. THE FIRST STARTING AND FINISHING FROM FEDERATION SQUARE. ALTERNATIVELY STARTING AND FINISHING AT PARLIAMENT HOUSE, SPRING STREET. Pre-1835. Birramung Marr celebrates the Birrarung ‘River if Mists’ and the original federation of the Kulin Nation. The ‘Yarra Yarra’ was the site of the first explorers and settlers’ arrival in 1835. What was their impact on the Kulin Federation and how did that influence Australia? 1901– Fed Square: Birth of Federation: Federation square celebrate the birth of the Australian nation. The Deakin Building celebrates Victorian Alfred Deakin 3 times Prime Minster and the father of Federation in Victoria. The plaza has nine visions of Federation in the 400,000 stone tiles in the plaza. There is one Cambrian shell – can you find it? Eureka paved the way for the national ideal of ideals of a new nation, a democratic ‘working mans paradise’ and created the national flag. 1990s – Degraves Street – 1990?s Cafe transformation, the people river. With Federation Australia began to look to America instead of England as the model for a free and independent nation. Harry Norris visited America each year and created 27 American buildings based on the exciting skyscrapers eg The Majorca and the Nicholas building. 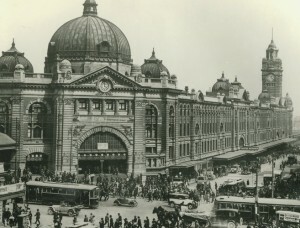 gave Melbourne a boost as ‘Marvellous Melbourne’, attracted international attention though the great exhibitions of the 1880s and inspired the Federation movement. 1890‘s – The Block Arcade 1891: Rise and Fall of Marvellous Melbourne. Australia’s use of world technologies eg Singer and Kodak shops set Melbourne on the path to self sufficiency and the confidence to create a new nation. The great crash of 1893 set back the federation movement however and the first referendum failed. The second was successful. 1880s -The GPO building 1886: The Centre of Melbourne, changes in technology, fire. 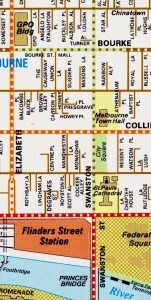 1910s – Bourke Street, Myers and Buckley and Nunn: Early Commerce. Sidney Myer who arrrived in the 1890s showed retail empire can be home-grown and Australians can be world leaders. He represented ideal of multiculturalism. A Jewish peddlar, youngest of nine children with no English can be successful and also great patriots giving hundreds of millions to art and science. 2000s – Union Lane: The New City the advent of Street Art 2007. Artist have played an essential role in the revitalisation of Melbourne. Manchester Unity is the great patriotic building, covered in Australian symbols, worshipping the virtues of Australians and aiming to save the country from the Depression. 1850s – Manchester Lane 1860s: Gold rush architecture, early settlement The Gold rush inspired immigration, democracy, working people, financial capacity and new technologies. it gave confidence to a young country and inspired trade connections around the world. 1920s – Nicholas Building 1927: Turning to America. One of the earliest of the American style sky capers turning people from the traditional British ideals to the New World of America, another ex-British republic. Treasury. Federal Treasury 1901. Eureka. Democracy. 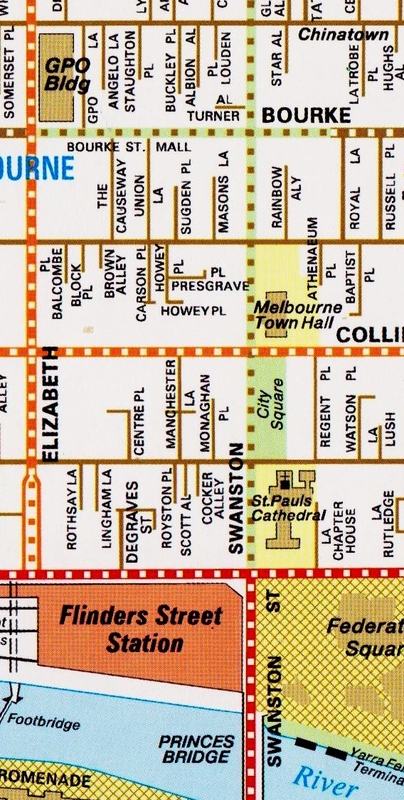 Also see Melbourne Walks’ Resources page for lists of further reading etc.